Next to Query name is the drop down list that shows the queries that have been created. They will have been created by the Sharelockholmes administrator if you are a new user. The list box under “Columns Selected in Query” shows the columns that will be displayed in the Share Selection screen for this particular query. The list box under “Available Columns” shows the extra columns that can be added for this query. A column can be added by selecting the column with the mouse in the “Available Columns” box and clicking the > button. A column can be removed by selecting the column with the mouse in the “Columns Selected in Query” box and clicking the < button. All columns can be added or removed by clicking the >> or << buttons respectively. 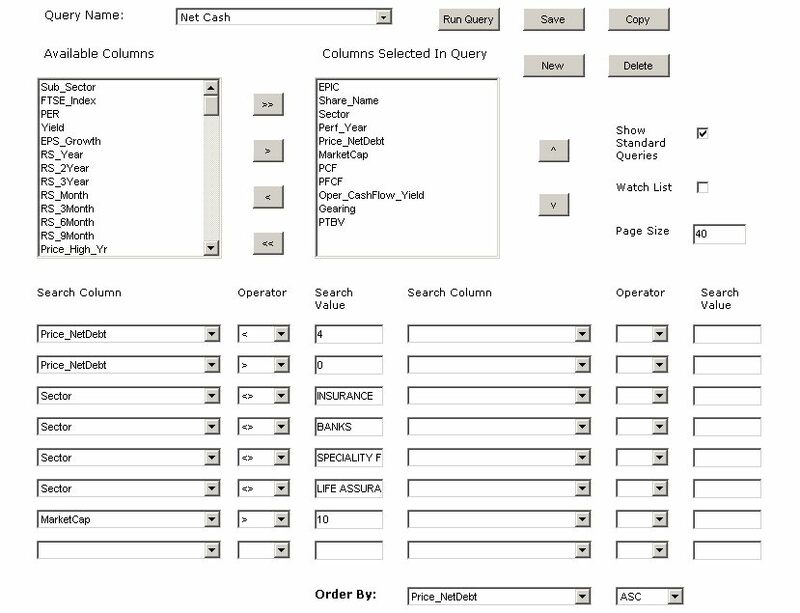 A column can be moved to a different position by selecting the column with the mouse in the “Columns Selected in Query” box and clicking the ^ or V buttons. The number of rows returned in a query per page can be controlled by with the Page Size text box. The maximum value is 100. The default is 26. You can turn the administrator created queries on and off by clicking on the "Show Standard Queries" check box. Selection of Shares is controlled by the “Search Column” and “Operator” drop down lists and the Search Value Text boxes. Select the Column you want to search on in “Search Column” drop down list. Descriptions of these columns are contained in the glossary. Enter a value for “Search Value”. This should be numeric for all columns other than EPIC, Sector or Last_Results_Date. Choose the Operator to compare the Search value with the column. The results can be sorted by choosing a column in the drop down list next to “Order By”. The results can be sorted Ascending “ASC” or Descending “DESC”.